A Hair Tissue Mineral Analysis (HTMA) is as useful for your horse as it is for yourself! This is a non-invasive procedure that uses a sample of hair to determine the body's mineral levels, ratios, and imbalances. Hair is a reliable testing source due to the way it interacts with the body's internal environment during growth. The hair is exposed to blood, lymph, and extra-cellular fluids, and once it hardens at the skin's surfaces, it retains the metabolic products it accumulated during the growth process. This biological procedure provides us with useful information regarding the body's mineral status and metabolic activity that occurred during the hair formation. This analytical technique is so specialized at detecting minerals, which are essential for a healthy body. It requires minerals for many of its functions, such as anti-oxidant and endocrine activity, cellular metabolism, DNA function, enzyme function, immune function, muscular activity, nerve condition, structural support, and water and acid/alkaline balance. A number of components, including a diet, environmental factors, and stress, can result in imbalanced mineral levels and toxic metal accumulation. This analytical procedure gives us the tools to provide the necessary diet and supplement recommendations to help the body regain balance. 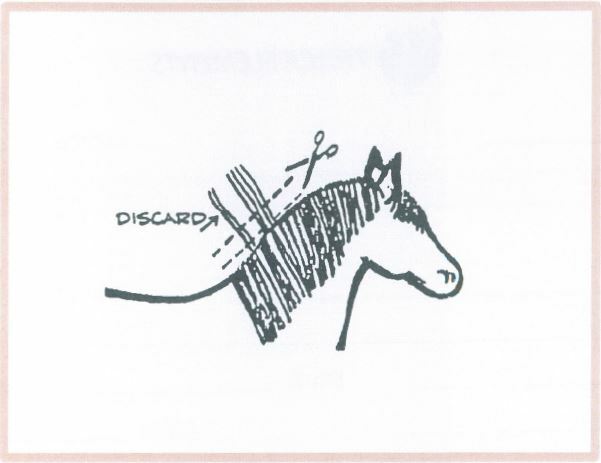 Cut the sample from the lower part of your horse's mane. Make sure to cut as close as possible to the skin. It is necessary to use high grade stainless steel or plastic scissors, as the use of plated scissors can lead to metallic element contamination. Use proper type of scissors to ensure accurate results. The sample length should not exceed 1.5 inches. Proximal (closest to skin) hair reflects the most recent metabolic activity. Use this part of the sample, and discard the remainder. The hair sample should weigh 125 mg (one tablespoon full). You can choose to purchase Consultation time with Practitioner Eileen Durfee if you need assistance or have any questions about the program. Practitioner Eileen Durfee has extensive knowledge and experience in Body Mineral Balancing from her work with Dr. Wilson, and she uses her background, along with scientific research, to interpret client results and provide appropriate recommendations.